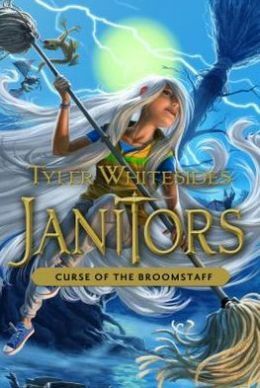 Presenting Janitors #3 Curse of the Broomstaff by Tyler Whitesides. Spencer sees himself, not to mention the fate of the rebels. In the author's words, this is one of the trashiest book he had ever read..... so in that context i'd say that this was definitely the trashiest book I ever read. The story literally and actually takes place around heaps and mounds of trash as the epic war between the rebel janitors and the BEM comes at a headway. They are finally about to find out the source of the glop and planning to destroy it preventing anymore creations or bastardizations of Grime, Filth and Rubbish.... The actual treasure hunt takes them to a land fill, the dumping and if correct the home of the mysterious Aurans..... But what they find there is another matter entirely. With a fast paced and well paced plot with the adrenaline induced adventure through the enormously magical landfill..... well the ending was rather unexpected..... I have no idea if this is the last book of the series r if there will be more after this one. But what I am certain of is you guys - both kids & adults and well teens out there, you need to read this series because despite it being a juvenile fiction, there is something in it for everyone and you will totally not be disappointed in it one bit. "An epic battle of the trashiest kind - Literally..... I RECOMMEND"
nice one very well thank for sharing.